The Dark Knight Returns, for one last time! The third and probably final Christopher Nolan Batman Movie looks like it will be going into production soon with a summer 2012 release. Speculation has been rife ever since the success of the second movie in the series The Dark Night became the second highest grossing movie of all time (it has since been overtaken by the giant Smurf movie). During that time Nolan has refused to be drawn on plot, characters and casting, this has only served to fuel the fires of speculation with rumors presented as fact. My personal favorites that Cher has been cast as Catwoman, I have no inside knowledge on the iner workings of Christopher Nolen’s brain or the Warner boardroom, but I think I can spot that one as made up! Probably fanned by studio statements saying there isn’t even a script yet there have also been rumors that their wouldn’t be a third movie or that Nolan would not direct it. You don’t need an economics degree (fortunately as I don’t have one) to work out that the studio are going to turn down this license to print money. Forget the Joker, he is locked away in the depths of Arhham, move on. Replace Ledger with a different actor. The middle ground, make a film about how the city recovers from the events of The Dark Knight where the Joker is mentioned but not seen. I favor the third option making the whole movie about moving on, recovery and rebirth, this would be relevant for the world at the moment and the way The Dark Knight finished. It would also represent a real story arc for Bruce Wayne and the City staring with the death of his parents at the start of Begins and ending with ??? My story would be something like this: The police face a war on the streets of Gotham as Mobsters move in from other cities to take over the vacuum left at the end of the last film. At the same time street gangs are trying to take over but are at war with each other and disillusioned with the police and Batman virility groups start appearing too. The place is a mess, with other violent crime, street crime and looting driving businesses out of the city. It is like the aftermath of a war or serious natural disaster. There is even a gang who worship the joker and emulate him by painting their faces the way he did, kidnapping people and taking hostages making demands such as the Jokers release. As all this is going on, in the background news reports describing how tests are underway to discover the true identity of the Joker and decide if he is fit to stand trial. This would include interviews with his doctor, Dr. Harleen Quinzel (she may go through a transformation following her involvement with the Joker), and his lawyer who claims the joker is innocent and was framed by Batman. Eventually we reach a point where public support tips and the people of Gotham want Batman’s help before it’s too late. This is a rough outline rather than a coherent plot that is something for the director and writers to decided and the first decision they have to make is how will it end? Without knowing where he is going he isn’t going to be able to write a coherent story of how he gets there. If we are to believe that it is the last of the Christopher Nolan Batman Movies and that he wants an “appropriate conclusion” and not a stepping stone to further movies. 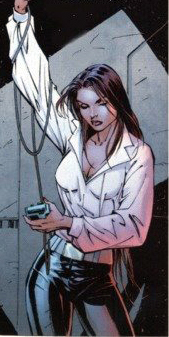 Bruce Wayne is arrested and convicted. Bruce Wayne stops being Batman as his job is done. Bruce Wayne gives up being Batman as he doesn’t think he can make a difference any more. Bruce Wayne hands the Batman persona to someone else to continue his work. Batman continues to fight crime because the world is imperfect and Gotham still needs him. 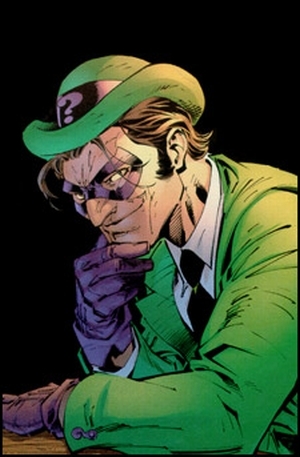 The Riddler: Edward Nigma: Criminal mastermind and all round loon, he likes to riddles and puzzles at scenes as clues. A regular in the 60’s TV show and played by Jim Carrey in Batman Forever (1995), a film so bad the only good thing I can say about it is that it was better than Batman Forever. The latest gossip/rumours have Joseph Gordon Levitt playing him in the new movie. 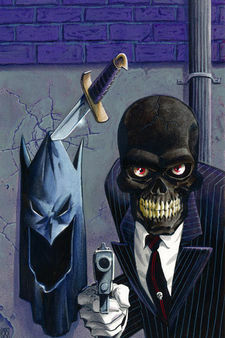 Black Mask: Roman Sionis: A former business executive/cult leader/mob boss and general criminal who hates Bruce Wayne. See more about him here. He has appeared on Tv in the aminated series but never in a real life version. 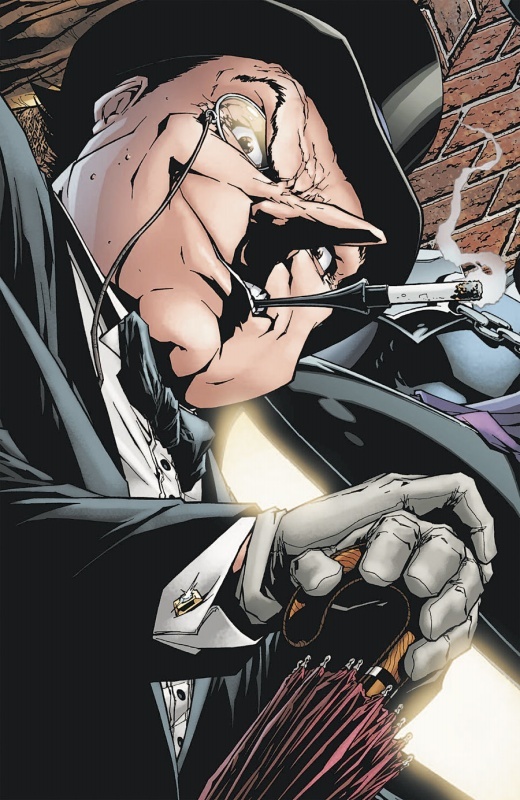 The Penguin: Oswald Chesterfield Cobblepot: Usually dressed in top hat and tails and carrying an umbrella he fancies himself a gentleman of crime. He was played by Danny DeVito in Batman Returns (2002). Christopher Nolan is said to have dismissed him as too unrealistic for his universe. As portrayed previously he would be but I think there is some room to manoeuvre here. He could simply be a tuxedo wearing nightclub owner with mob connections and a fast growing crime empire. 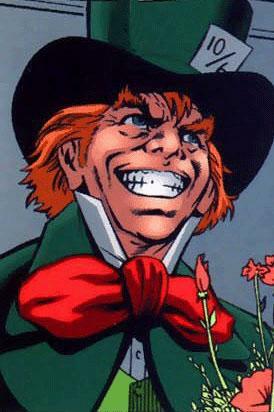 The Mad Hatter: Jervis Tetch: A scientist with an obsession with Lewis Carroll, his appearance is based on the character of the same name from Alice’s Adventures in Wonderland. An old-school villain from the 40’s and 50’s he appeared in the 60’s TV show and the animated series but has not been used in the Burton or Nolan Batman universes. As part of the rebirth process Bruce Wayne needs a new love interest, it has to be someone who is in some way dangerous or inappropriate, the ideal choices would be Harleen Quinzel, Talia al Ghul or for me the only real choice would be Selina Kyle. As this is potentially a last movie and there isn’t time to play with characters there is no point in introducing Harleen Quinzel if she isn’t going to become Harley Quinn and there is no point in introducing Selina Kyle if she isn’t going to become Catwoman! Given the first two movies whatever he decides to do with it I’m in. He certainly hasn’t let us down so far! And where does Batman go from here? This would still be my first choice.